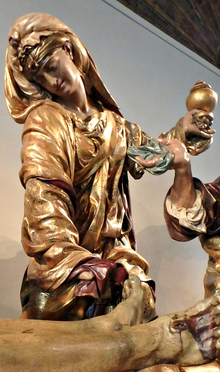 Spanish Renaissance and Baroque sculpture, with its fervently religious content and unflinching, sometimes overwrought style (so much blood! ), has always seemed to me to be an acquired taste--one that I had not developed. But on a recent trip to Valladolid, an industrial city about 100 miles northwest of Madrid that is home to Spain's National Museum of Sculpture, I was converted. There is much genius in the polychrome wooden sculpture the Spaniards mastered and continued to make long after sculptors in other countries switched in droves to marble, bronze and other materials. More than any other work in Valladolid, "The Burial of Christ," created around 1540 by Juan de Juni (c. 1507–1577), brought me around. Juni, a Burgundian (originally, Jean de Joigny) who had moved to Spain by his mid-20s, ranks with Alonso Berruguete (1488–1561) as the best of Spanish Renaissance sculptors. Both were inspired by classicism; both were influenced by Michelangelo. Both portrayed Biblical scenes and Christian saints. But Juni carved his pieces more slowly and carefully in a more detailed, more realistic, evocative style. 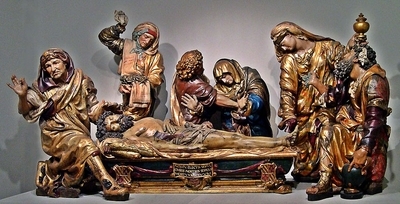 "The Burial of Christ," commissioned by a Franciscan friar and bishop named Antonio de Guevara for his burial chapel in a Valladolid monastery, is an ensemble of seven life-sized figures. 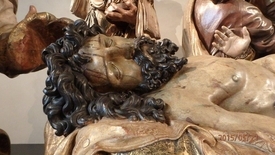 Also known as "Entombment," it sits, nearly alone, in a small gallery under a resplendent gilded, coffered wooden ceiling that dates to the late-15th century, when the Colegio de San Gregorio that houses the sculpture museum was built. At its center is the near-naked dead Christ. He lies flat on a casket, drained of life, his head slightly tilted back. Blood, now coagulating, has oozed from his wounds; his deformed left hand, broken by the nail hammered through it, sits awkwardly on his chest. His head, crowned by a mass of curly hair, resembles the ancient Roman sculpture of the dying Trojan priest Laocoön, which had been discovered in Rome in 1506, causing a sensation that rippled through the art world of the time. Whether Juni ever traveled to Italy is a matter of conjecture: some texts say he did, but Manuel Arias Martinez, subdirector of the Valladolid museum, said there is no recorded evidence. Juni, he added, learned his classicism from Italian engravings that were circulating in Spain. Replete with violet bruises, Juni's virile Christ palpably captures the agony he endured during his long Passion. It might well have been a masterpiece on its own. Yet Juni goes on to create a moving tableau surrounding Christ of six figures, grouped in pairs, in loose symmetry around a central axis. At the far left stands Joseph of Arimathea, the wealthy man who asked Pontius Pilate for the body, which he intended to place in his own prepared tomb. Somber-faced, with furrowed brow, but dressed richly in fine shoes and exquisite garments, he alone engages with the viewer. He looks out directly, exhibiting in his right hand a long barb taken from the crown of thorns that had been pounded into Christ's head. Opposite him, on the far right, is Nicodemus, who helped Joseph take down the body from the cross. Here Nicodemus looks away from the viewer, his eyes on Mary Magdalene, who stands near him, behind the coffin. As her flowing garments show, she is in motion: her taut face intent on preparing the body for burial, she grips in one hand a cloth soaked in the blood wiped from wounds on Christ's feet. In the other, she holds aloft a golden bottle of ointment, for anointing the body for burial. Her counterpart on the left side, near Joseph of Arimathea, is Mary Salome. Sometimes identified in scripture as the wife of Zebedee or the mother of James and John, two of the twelve apostles, she holds the crown of thorns and clean cloths, probably for wrapping the body. The central pairing, of John, the apostle Jesus loved, holding up Mary, his grieving mother, is pure poignancy. Just as she cannot face the dead Christ, the distraught John cannot meet her eyes. 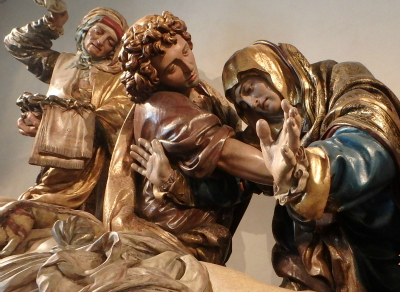 Portrayals of this entombment scene were common in the 16th century (and before), but many were staid, stolid pieces. Juni animates his "Burial," giving his characters movement, reflected in the flow of their deeply draped garments; in the rhythmic gestures of the characters' hands and bodies; in the contrasting details in their dress; in the soft modeling of his true-to-life figures. Juni unifies his ensemble by grouping the characters in overlapping circles. At the center, John embracing Mary form one, as do the three figures on each side of the composition.All six figures also create a semi-circle in relief around the dead Christ, with Joseph and Nicodemus advanced to the foreground. When the piece was made, "The Burial of Christ" was set in an outer structure flanked by columns and two soldiers. But these features had disappeared by the time the sculpture arrived at the museum in the mid-1800s. And sometime in the 17th century, the polychrome design, which was applied by a different, anonymous artist, as was the custom, was painted over. The museum restored it to the original about 35 years ago—leaving one small patch, on the back of Nicodemus, to compare (it doesn't)—and re-revealing the sculpture's brilliance. With its unwavering realism, but never sensationalism, Juni's "Burial" illustrates the beauty of a tragic task.